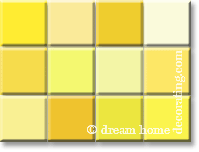 Use the psychological effects of the color yellow to create a bright, optimistic feel for your home. "Yellow never works", said a seasoned interior designer to me a little while ago. I'm not sure I agree! However, the color yellow is definitely a force to be reckoned with. People respond strongly to it; they usually either love yellow or they hate it. 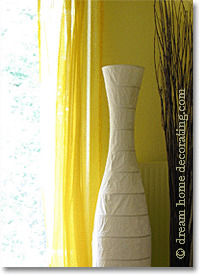 ... yellow can add a burst of sunshine to any room! Yellow is often described as an optimistic, life-affirming color that reminds us of sunshine and stimulates our mind, body and emotions. Some people also find that it helps them with concentration. The effect of the color yellow obviously varies with its intensity and hue. A pale, atmospheric tint of yellow on walls or ceiling can add 'sunshine' to a room, while saturated, intense yellows might make you feel cranky after a while. Because opinions about this color are so divided, I suggest you don't worry too much about how the color yellow affects others - unless you share a home with them, of course. You may not necessarily want it on a wall in your home, but there are other ways of utilizing the psychological effects of the color yellow. For example, yellow makes for great "highlights". You could use smaller doses of it in accessories, flowers, or pictures to brighten up darker areas and make them 'smile at you'.